I am chasing an apparent overheat issue on my monsoon (98). I noticed the temp sensor for the dash gauge was not original so I ordered a replacement. The guy I bought the boat from also had a "spare part" that he didn't know what it was. It is the original temp sensor. The original one didn't measure anything like this chart so I discounted it as broken. For example at room temp the orig and new one read 950 ohms and the one that was in the boat reads 3.5k (and 68 is about right). Is my chart wrong? I am guessing not because the gauge on the boat read close to right for the non-oem sensor. Is there more than one standard? It seems I have the wrong one for my gauge. Just to back up a little... what is it saying your engine temp is when it is supposedly overheating? Quickest way to confirm a bad gauge or sensor is to shoot the manifold where the sensor is installed with a temp gun. Not at all familiar with that engine but shoot near to the sensor and compare to what the gauge is reading. Then I would ohm it out to determine which is bad, the gauge or the sensor, if it is in fact not a real overheat issue. Also, the chart you have has to be matched up to the kind of RTD you are using... there are different charts for different types of RTDs. Maybe someone already matched this chart to the same sensor they are using on their Monsoon? Try to shoot into the threads of the sensor. My gauge was always showing 175 but the laser showed 156 constant at the sensor. At the advice of a mechanic I ran a direct hot to the MDC & that fixed the temp sensor. After I cleaned every wire terminal I could find on that boat it fixed other gauge issues but my oil pressure is still off even though mechanical gauge shows it is fine. don't have teflon tape on the op threads, do you? I will shoot the sensor with an IR thermometer. But I don't have a ton of faith that it is accurate. It takes an average over a region and the external temp will not match the internal temp unless you let it settle for a while. I wish I knew what the ECM thought the temp was!!! 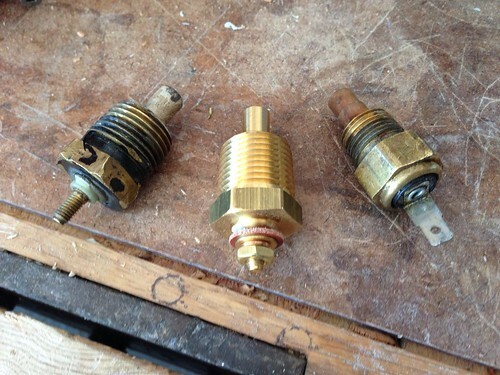 Another thought is to warm it up, turn off the engine, and put an ohm meter on the temp sensor the ECM uses. I will give that a shot too. To test the gauge I have some resistors that I will put in series to make a known resistance and see what the gauge reads. Any idea how to know which chart I should be using? Even a list of standards would be helpful so I could google them. The original sensor and the replacement are definitely using a different curve then the one I pulled from the boat. No teflon tape. It needs a good solid ground through the threads as it is a one wire sensor. But note that any added resistance will decrease the read temp because these are all negative coefficient sensors. In using a temp gun its just the first thing I do to let me know if there is a real problem or not. 5 deg or less difference and you could probably assume it is reading correctly. Then it might just be that your engine runs that close to the alarm point and that the gauge or sensor is reading 5 deg off and it puts you over the top... however if you see a 20 deg difference then the sensor or gauge is definitely bad. I would think if it has a manufacture or part # you could find a corresponding chart online. I would think most coolant RTD's use the same type. Dont quote me on that though, there are instrumentation guys on here that probably know a lot more about them than I do. Most resistance/temperature charts you find are for the sensor connected to the ECM. I installed the new one and sure enough it read way high (180 degree without starting the engine!). I unplugged the harness in the dash and verified the same ohm reading in the dash as at the gauge. I also checked the model number of the gauge and it is a teleflex 84590. All the teleflex docs say it should be ~700-800 ohms at room temp. This is in the same ballpark as my readings. This makes me think the gauge is bad. 6$ with 10$ shipping. Still crazy cheap! I swapped the gauge and took her out last Sunday and put 3 hrs on the clock. Never got above 175 on the gauge. Never went into protect mode. At this stage I think all is good! (Knock on wood!). Thanks, I ordered that one for a grand total of $15.95. My local dealer wanted $75. I couldn't believe how cheap it was either but it came quickly and looked brand new. An exact match for the original!